You are here: Home / Uncategorized / Easter Eggs with a Hair Dryer?? Easter Eggs with a Hair Dryer?? I know this is an out of order post, but when I was browsing my pictures & saw these I just had to post them! So for your viewing pleasure, apparently when your 12 & 13 its much easier cooler to make Easter Eggs when you put a plastic wrap around them & blow on them with a hair dryer! Just plain old coloring just isn’t in anymore! 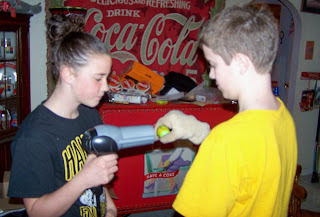 Who would have ever thought that a hair dryer had so many other uses?